Dr. Gailitis and Dr. Burks have been performing vision correction surgery in South Florida for over twenty years. In fact, they set up the first laser vision correction facility in the area and taught many eye surgeons from around the country. In 2001, they opened The Center For LASIK, a state-of-the-art facility dedicated to laser vision correction. You will find our practice different from other centers offering LASIK. First, Dr. Gailitis and Dr. Burks are intimately involved with your care from the initial consult, preoperative exam, surgery, and postoperative care. In other centers, you may not meet the surgeon until the day of the procedure. Sometimes a surgeon may fly in the day of surgery and not be around if there is a postoperative problem. Second, we are conservative with our recommendations. We won’t recommend surgery to patients if we don’t think they will achieve excellent results. We also offer other procedures (see “What If I’m Not a LASIK Candidate”) if LASIK is not the best option. Other centers may be hesitant to turn patients away, or not offer other treatments even if they are in the patient’s best interest. Third, we strive to offer the best technology available. We are continually updating to the latest technology and procedures for LASIK. Finally, we do all of the above in a service-oriented environment. We know that your time is valuable. After all, we know that you don’t want to have LASIK, but you want to have what LASIK offers- freedom from glasses and contact lenses. Just check out our Facebook page to see what people are saying about us! 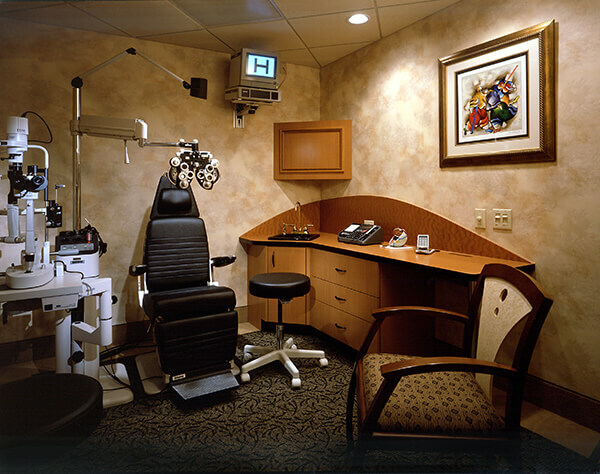 Our facility was built specifically for permanent vision correction. You'll notice the difference in the consultation room, the pre- and post-op rooms and the laser suite. Stop by and see for yourself. What If I’m Not a LASIK Candidate?